Chinese cuisine is very diverse, reflect the main distinct regions of the country, each of which is known for having their own tastes and flavors. These regional cuisines include Cantonese ("Yue") and Szechuan ("Chuan"), which are both well known in the West, as well as Anhui ("Hui"), Fujian ("Min"), Hunan ("Xiang"), Jiangsu ("Su" or "Yang"), Shandong ("Lu"), and Zhejiang ("Zhe"). In addition, many people from China have emigrated to other countries around the world, and created new dishes based on the fusion of traditional Chinese dishes with other countries' flavors. Congee - A type of porridge. Congee is usually made from rice, but other cereals such as barley, cornmeal, millet or sorghum are sometimes used instead. Dumplings - Chinese dumplings may be fried ("guotie"), steamed ("jiaozi") or boiled ("shuijiao"), and generally contain ground meat or vegetables. General Tso's Chicken - This is an American-Chinese dish which is popular in North America, but rarely eaten in China itself. The chicken is deep-fried, and served in a sweet and spicy sauced. Kung Po Chicken - A spicy chicken dished containined Sichuan peppercorns, Shaoxing wine, and nuts (peanuts or cashew nuts are used). In the West, the dish is often adapted if some of the traditional ingredients are not available - for example, bell peppers may be used for flavoring. Peking Duck - A duck glazed with syrup and then roasted or fried. The duck meat is carved at the table, and then eaten with steamed pancakes, plum sauce, and scallions. Soy Egg - A hard-boiled egg, with soy sauce, sugar, herbs, spices and water. Xiaolongbao - Steamed buns containing a meat soup, seafood or vegetables. The meat soup variety is prepared by placing meat gelatin in the bun before steaming, and the gelatin turns to soup during the cooking process. The buns may be made with raised or unraised flour, all the unraised flour version is usually only eaten in southern China. Zongzi - Glutinous rice and a filling, wrapped as a parcel inside bamboo leaves. 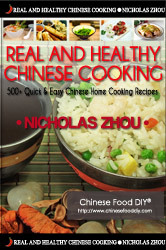 Want to learn more about Real & Healthy Chinese Cooking? 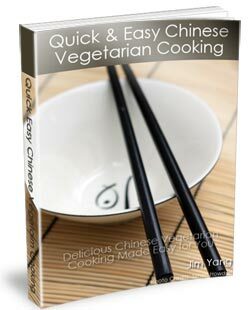 If you have anything to say about any of these Chinese cooking products, please leave a comment either on this page, or on the individual product's review page.